I have however found time to keep creating new chocolates. Keeps me happy and my friends happy and my husband happy, and my kids happy. It really is quite fun when the children's friends come by and I stuff them full of coconut cream sugary goodness, caramels, chocolates and fudge. It is fun to send 6 chocolates in my teenage daughters lunch and have her share them during her lunch hour with her pals. There is great joy to be found by making other people happy....especially when it is with your cooking. Oh yes, and I have found another distraction in my life - INSTAGRAM! Goodness, if you are a follower of my blog, please find me on Instagram. I get such a kick out of seeing what all you ladies and gentlemen have got brewing in their kitchens and homes. Great fun. Back to these tricky little hazelnuts. I have been purposefully ignoring them. They are only one of the quintessential flavors that pairs so nicely with chocolate... hello.... Nutella. But, I just kept thinking, overused, overrated, overdone. I was really wrong on this one. I have found a new friend, Hazel Nut. 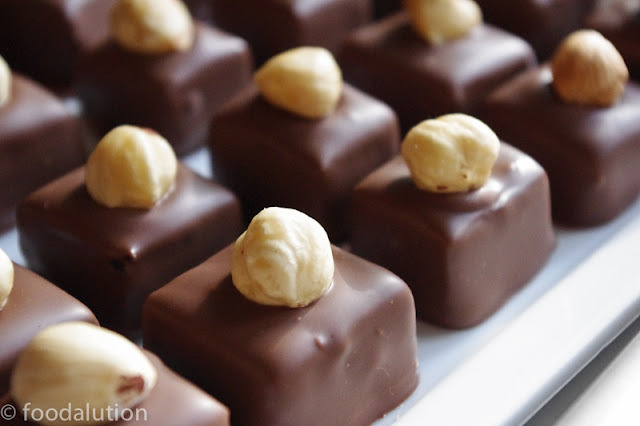 While making these chocolates, I made something so delicious you will want to spread it on everything.... and mix it into your cookies, cakes and sprinkle in on your frosting and put in on your morning toast. Hazelnut Paste. Hazelnut Paste- Delicious treat to keep in your fridge for your next hazelnut cravings or to mix with butter and drizzle on your next pound cake or ice cream. Toasting the hazelnuts - To toast, set oven to 350. 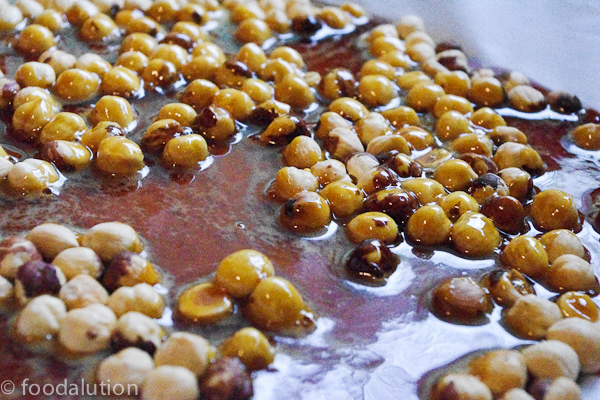 Place hazelnuts on baking sheet and place in oven for about 8 -12 minutes. Check at 8 minutes, when the skins of the hazelnuts start to darken and pull away from the nut, you want to pull them out. Let cool for about 5 minutes. 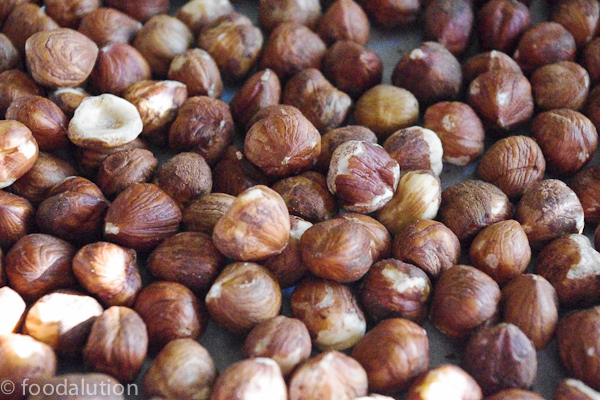 Place hazelnuts in a kitchen towel, about 1/4 of the nuts at a time and roll the nuts around, until their skins have come off. Do not panic, not all the skins will come off. Place in a colander and shake to remove loose bits. Repeat this process with the rest of the nuts. Spread nuts on baking sheet lined with parchment paper. Combine the sugar and water (stir until all sugar is moistened) in a heavy-bottomed pan and cook over medium/high heat. Cook until you have a nice dark amber. If you over cook, you will burn it. Take off heat and pour over the hazelnuts. Let cool, break into pieces and then throw this into your Vitamix or food processor. Grind until you have a nice paste like consistency. If you happen to have hazelnut oil on hand, you can add a few drops to assist in the grinding process. Voila... you are finished! Now go enjoy! I used my paste mixed with chocolate to form the bottom layer of my chocolate confections. See photo below. Inspiration for these chocolates came from the wonderful Andrew Garrison Shotts. I layered the hazelnut chocolate praline on the bottom and then a coffee ganache topped that layer. 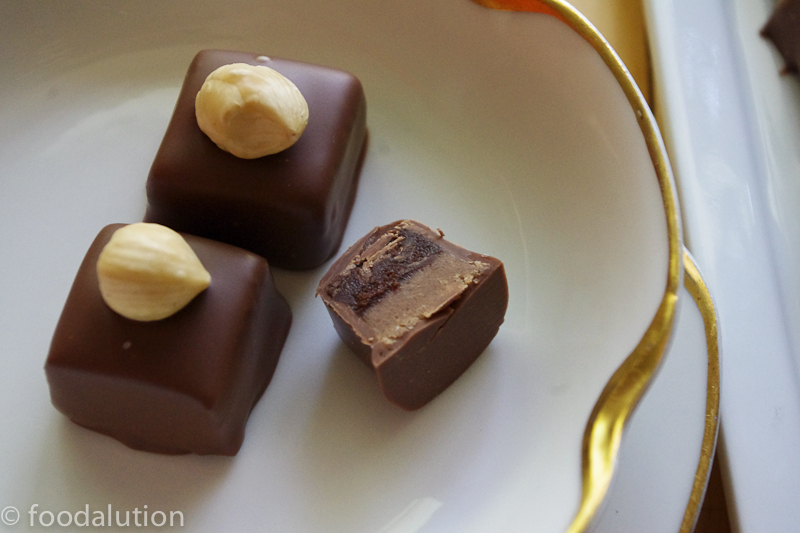 Very fun to have the brightness of the coffee mix with the mellow sweetness of the hazelnut praline. If you happen to have flavor suggestions for chocolate confections.... please post below. I am taking any and all suggestions.